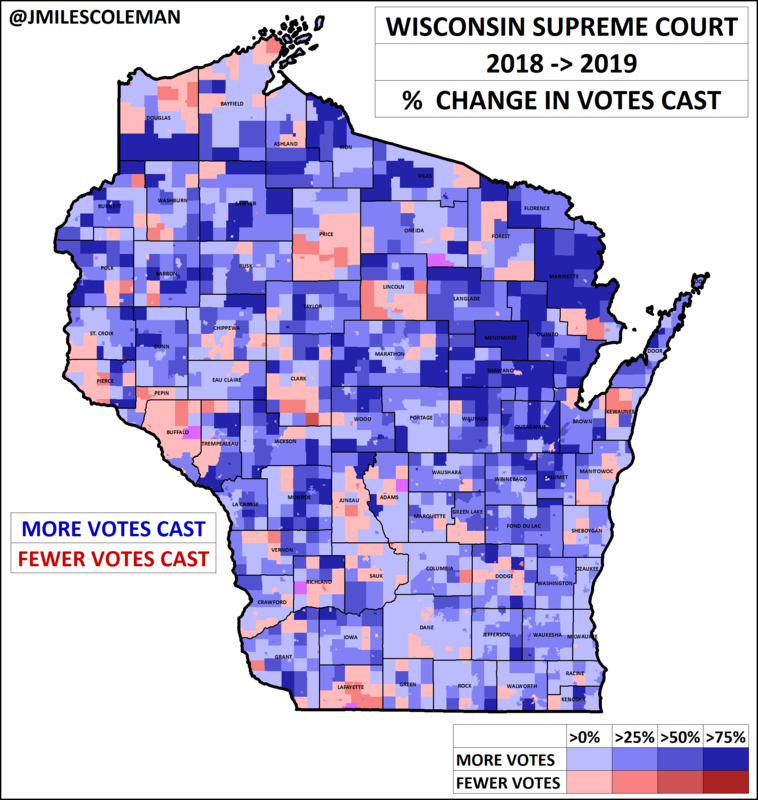 Following up on our initial post on last week’s Wisconsin court race, here are a few other bonus maps. Since then, judge Lisa Neubauer (Democratic-aligned) has conceded to conservative Brian Hagedorn, after trailing by roughly 6,000 votes. This leaves the conservatives with a 5 to 2 majority on the Wisconsin Supreme Court. One request I received often was to look at turnout, and how that may have impacted the race. Though the 2018 court race was a 12% win for the liberal candidate, I felt, in terms of turnout, it offered the best apples-to-apples comparison. Statewide, turnout in the 2019 court race was just below 30%, but even this was an increase from last year. Compared to 2018, 21% more votes were cast this year (121K compared to 99K). In this map, blue towns cast more votes in 2019 than 2018, while turnout was down in red towns. To some extent, this map reflects the population. Larger municipalities (such as Madison, Milwaukee, and Green Bay) saw this biggest increases in raw votes being cast. An interesting exception to this trend was Manitowoc, which is crimson. 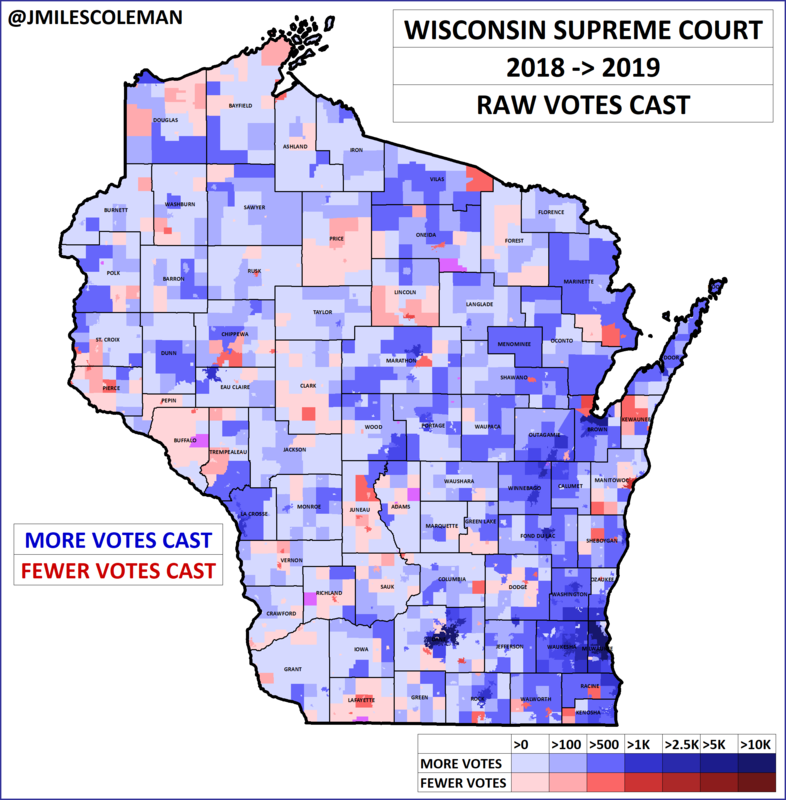 For many Badger State political observers, the outcome, and margin, of the 2019 court race hearkened back to 2011. That year, right after Gov. Scott Walker (R) took office, Democrats went all-out to defeated conservative justice David Prosser with liberal JoAnne Kloppenburg. 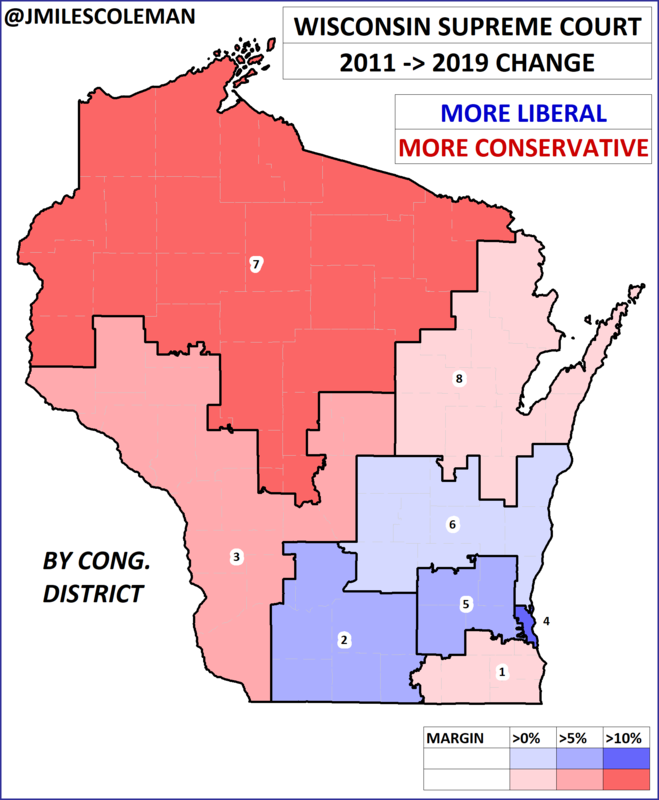 The result was a narrow win for Prosser – thanks in large part to his showing in the famously ‘crucial’ Waukesha County. Broken down by Congressional District, the pattern is still obvious. All eight districts voted the same way in each election, but the change in margins was telling. If there’s any good news for liberals here, it’s that the timing of the 2020 court race should favor them, as it will be held during the Presidential primary. The crowded Democratic field should draw their voters to turn out, while the President will (likely) have little competition on the GOP side. Justice Daniel Kelly, a Walker appointee to the court, has not announced whether he’ll seek a full term. Either way, I’m sure we’ll be mapping it to the town-level.